Fresh food markets in America are somewhat limited. They are often called Farmer’s Markets. There are many very large food stores in the U.S. where customers can buy a great variety of foods. Some of them are as big as two football fields or more and have parking lots that can hold hundreds of cars. Typically called “supermarkets,” they often offer foods from around the world and may feature a Mexican food section, one with Asian foods, and others. Although it is possible to find a very limited number of already prepared foods, this is the spot to get cooking basics. 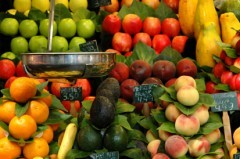 Each large supermarket has a giant produce section where “fresh” fruits and vegetables are sold. Because of the cold weather in many parts of the U.S. that lasts for around six months each year, it is not possible to grow some fruits and vegetables in the country. For this reason, not all produce is truly fresh if it has been shipped from South America or Mexico. 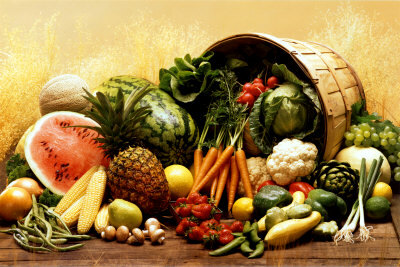 Fruits and vegetables that have been transported by air or land may be three or four days old by the time they reach the supermarket. Some fresh food markets are open year-round, but their products are different than ones during the growing season. They sell cheese, jelly, coffee, salsa, and baked goods that are freshly made, but any produce must be shipped in from California, Mexico, or South America. 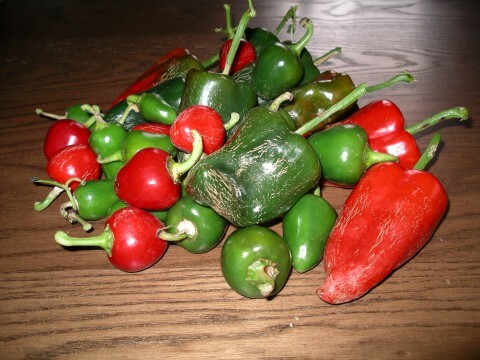 During the growing season, a great variety of fruits and vegetables that have been locally grown are available. These include asparagus, radishes, rhubarb, scallions, spinach, strawberries and tomatoes in late May and early June. 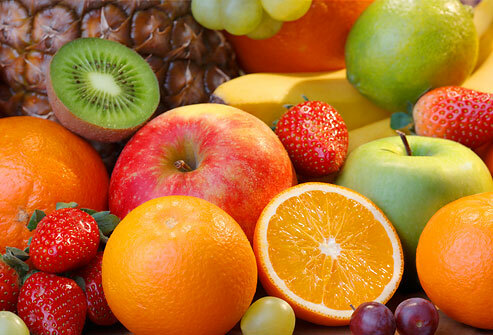 By July, the farmers are bringing many other fresh fruits and vegetables to the markets, such as corn, watermelon, cantaloupe and honey dew melon, blueberries, blackberries, raspberries, peaches, lettuce, and more. They sell chili peppers, beans, green, red, orange, and yellow peppers, fresh herbs, pumpkins, apples, and honey as well. Farmers in different areas of the country sometimes sell their extra produce at stands they set up in parking lots at churches or other buildings. A Midwestern farmer may have a lot of corn ripen at the same time, so it will be sold to local residents at a cheap price. Tomatoes are also usually very abundant, as well as green peppers or other peppers, and melons during July, August, and into September. 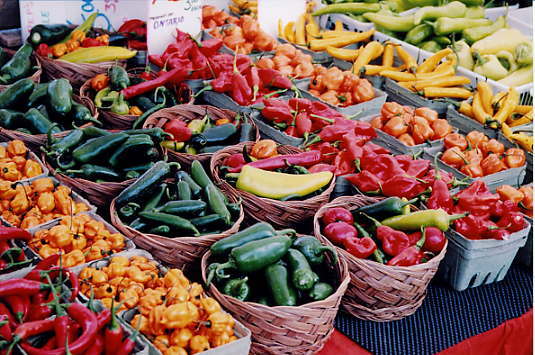 A few areas of the U.S. have a longer growing season, so their Farmer’s Markets are open for more months each year. For the most part, fresh food markets are open from May through October – late spring, summer, and early fall in cities and towns through the U.S. Depending on the region of the country, the markets sell different items. For instance, along the East Coast, in the North, or Midwest, weather is very cold and it is impossible to grow produce after October. On the other hand, Florida, California, and a few Western states have much warmer weather and their growing seasons are a little longer. California produces a great deal of the country’s fresh food, and Southern Florida’s tropical weather produces plenty of oranges, lemons, and limes for the country. Fresh food markets in America are a special place to go for many people. Farmer’s Markets often have 100 farmers with their goods set up in booths in a city park one time a week, or once a month. There is usually entertainment provided at these large events, with live music and fun for families. Craft items are also sold at these markets, and some allow 35 percent of their items for sale to be crafts rather than fresh food. In the fall during October, pumpkins very abundant and are ready for sale. Apples produce great amounts on their trees before taking a break for the winter, so a Farmer’s Market held at this time of the year will feature these items.